A 74-year-old woman status-post left breast lumpectomy in 1987 presented to our facility for consultation, following a new outside diagnosis of biopsy-proven left breast invasive ductal carcinoma. In addition to the biopsy-proven malignancy within the breast, provided outside static ultrasound images documented the presence of a nonspecific axillary mass. 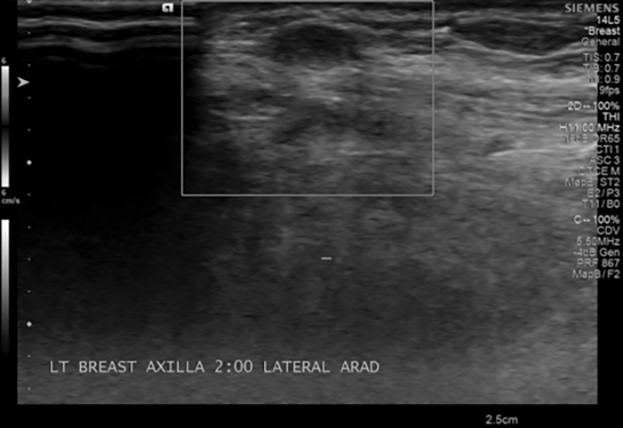 Repeat axillary ultrasound was performed, as provided images did not demonstrate classic sonographic features of a normal lymph node. Sonographic evaluation revealed two oval, parallel, predominantly hypoechoic, circumscribed and indistinct masses in the lateral axilla, just deep to her visible axillary dissection scar. Neither mass contained a clear echogenic fatty hilum or displayed internal color Doppler flow. Fine needle aspiration was recommended and performed, due to concerns that the thinness of the tissue might not accommodate a 12-gauge core biopsy needle. FNA results were inconclusive, and core biopsy yielded the result of traumatic neuromas. Two parallel, oval, hypoechoic masses within the lateral axilla, just deep to a visible skin scar from remote axillary dissection showed no internal color Doppler flow and did not display clear echogenic fatty hila. One measured up to 6 mm, was homogenously hypoechoic, and had circumscribed and indistinct margins. The larger 16 mm mass contained a thin linear echogenic component and displayed posterior enhancement. Traumatic neuromas are rare, with relatively few cases identified in the literature since 2000. Although benign, they must be distinguished from recurrent tumor in patients with a history of surgical treatment for malignancy. These masses may be palpable and are seen in association with the surgical scar. They are the result of a hyperplastic, reparative response to nerve injury, and form during attempted reinnervation of the area. Although most frequently arising in the radically dissected neck or extremities, these have also been reported in association with mastectomy. There is a paucity of published cases of neuromas in cancer patients after surgery when compared with cases after amputation or surgery for benign conditions. Li et al, using data presented by Wang et al, show that traumatic neuromas excised from post-mastectomy patients with a subcutaneous mass arising near the scar an average of 5.3 years after surgery are often palplable, painless masses that are typically oval, circumscribed and homogeneously hypoechoic on ultrasound.1,2 Baltarlali et al reported a case of traumatic neuroma two years post mastectomy and Kim et al reported a case of traumatic neuroma 14 years after mastectomy.3,4 Our case demonstrates imaging findings concordant with that which has been published to date and shows that histopathologic diagnosis can be made with percutaneous core biopsy sampling. Traumatic neuromas are a well established finding in patients status post amputation; however, traumatic neuromas in patients who have undergone mastectomy is not widely reported. Clinical findings and sonographic features of traumatic neuromas, a benign entity, can mimic more sinister pathology. For this reason, traumatic neuromas should be considered in the differential when encountered in practice. Definitive diagnosis can only be made after biopsy and analysis by pathology. Our case demonstrates successful use of percutaneous core biopsy sampling providing final diagnosis of traumatic neuroma. Li et al. : Traumatic neuroma in a patient with breast cancer after mastectomy: a case report and review of the literature. World Journal of Surgical Oncology 2012 10:35. Wang X, Cao X, Ning L. Traumatic neuromas after mastectomy. ANZ J Surg. 2007;77:704-705. Baltalarli B, Demirkan N, Yagci B. Traumatic neuroma: unusual benign lesion occurring in the mastectomy scar. Clin Oncol (R Coll Radiol) 2004; 16: 503-504. Kim EY, Kang DK, Kim TH, Kim KS, Yim H. Traumatic neuroma in a breast cancer patient after modified radical mastectomy: A case report. J Korean Soc Radiol. 2011;64:515–518. Messinger JD, Crawford SM. 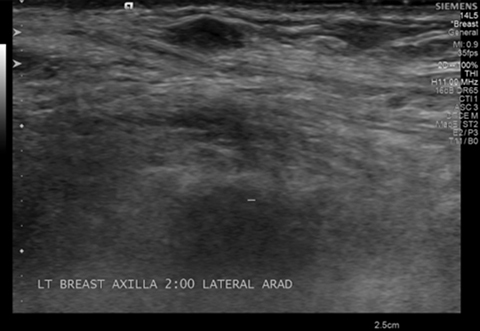 Traumatic neuroma in axillary dissection scar bed following mastectomy. Appl Radiol. 2017;46(9):38-39. Prepared by Dr. Messinger while a second year Radiology Resident, and Dr. Crawford while an attending Radiologist specialized in Breast Imaging at the University of Louisville in Louisville, KY.